Yet another post without a recipe, but I grilled pizza for the first time today and took pictures, so I thought I’d post them in case it inspires anyone else. I know grilling pizza is hardly revolutionary, but I had a lot of fun and would like to share. First I lit the fire and let the coals burn until they were mostly white. Although it’s in the mid-90s today, which makes slaving over a hot grill a bit ridiculous, one advantage grilling pizza has over baking it in the oven is it takes the oven and baking stone nearly an hour to come up to temperature, whereas the grill took next to no time. I also wasn’t heating up the house, although I am about to turn the oven on to bake a couple loaves of pain au levain, so I’m not doing so well at keeping the kitchen cool after all. While I was waiting for the briquets to be ready, I got everything ready on the table. Here are our two pizza crusts on peels; I’ve sprayed the tops of them with olive oil. I used my whole wheat version of Peter Reinhart’s New York style dough. I made my normal pizza sauce: saute crushed garlic and red pepper flakes in olive oil, add crushed fire-roasted tomatoes, salt, pepper, and, sometimes, oregano; cook for 10 minutes and optionally puree. I also had Daiya mozzarella ready. When the briquets were ready, I spread them out, then put the rack on the lower position. Then I picked one crust up and put it on the grill olive oil side down. I sprayed the top with more olive oil then closed the grill for a minute or two. When I opened it, the crust was bubbling like crazy! When the crust was firm enough that it was no longer sticking to the grill, I used an aluminum peel to remove it and flip it over onto the wooden peel. it got a bit darker than I’d intended, but I don’t think it matters – charred is good! … and returned the pizza to the grill, sliding it off the peel. I closed the grill and let it cook for a few more minutes, checking it every minute or so until the bottom was done and the “cheese” was melted. Verdict? This was great! There’s room for improvement: next time I’m going to try to roll the dough out thinner, and I might move the rack to the upper position so the pizza has a chance to bake a little longer before starting to burn. But considering it was my first time grilling pizza and only my 4th or 5th time ever using a grill, the results were very impressive, and very tasty. I’m definitely going to use this method for our weekly pizzas whenever the weather allows. In other news, I’ve had a very productive weekend. I mentioned in my last post that I recently bought a whole bunch of vintage mason jars to store dry goods in and I even posted a picture of my newly organized baker’s rack. Well, yesterday I found a great rack for storing my jars in my favorite antique store – it’s the perfect size for the jars and fits perfectly next to my baker’s rack – and what’s more it was only $24! How awesome is that?! Where I had some of the jars on the baker’s rack, I moved them to the new rack. Then I emptied half of my over-stuffed cupboard onto the newly-freed shelf on the baker’s rack, which means for the first time in years I can actually see what I have. I discovered I have three bottles of apple cider vinegar because I could never see the bottles I already had. THAT gave me plenty of space in that cupboard to spread out my canned goods so I can see THEM and so they are not falling on my head when I open the cupboard door. I always feel so good about life when I organize the kitchen! And now that my dried beans are out on display in the dining room, I’ll see them and think to make them more often, in fact, I’m soaking some right now for dinner tonight! I hope everyone has had as nice a weekend as I have! Apparently Torticia has. Hello, friends. No, I haven’t abandoned the blog – I just haven’t cooked anything new or original in a few weeks, and I’ve been fairly busy. I don’t have a recipe for you tonight, but to tide you over, here’s a personal post. Seemingly ages ago, Zoa at The Airy Way passed on a Happy 101 award to me, which means I have been requested to list 10 things that make me happy. Because I’m very shy – you may not believe it because I do share personal stuff periodically, but perhaps even more shy online than in person – and because I find it hard to believe anyone cares what makes me happy, and actually I bet most of you can already list 10 things that make me happy anyway, I would ordinarily have been happy to “forget” to address this. But for some reason, I’ve been thinking about it a lot. So I’ll do it – I’ll tell you 10 of the things that make me happiest. Mostly I’m doing this to pimp Zoa’s blog, though, because I think she is incredibly creative and she’s always doing amazing things, like making realistic poached “eggs”, and doing mind-blowing things with my nemesis okara. Really, you need to check it out if you don’t already – she has one of the most impressive blogs I’ve seen. I wish she lived in Virginia instead of Canada so she could cook for me! So, on with my list of things that make me happy. I think you know what #1 is going to be. 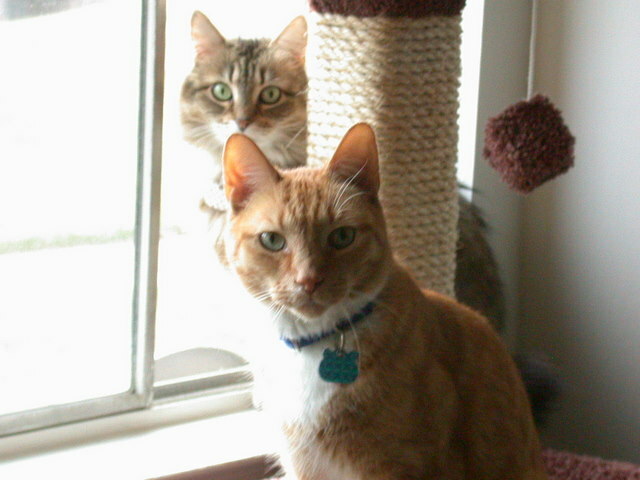 Really, if you’ve read more than two of my blog posts, you know it’s all cats, food, and books, right? And memories of Tigger and Brachtune. I am awed by how much I love these cats and no matter how bad my day has been, they make it better. More broadly, though, I would say that all animals make me happy. I am far more relaxed going into a home that has pets than I am one without. If I am walking or driving down a street and spot a cat, I’ll point and shriek, “kitty!” like a 3-year old – and if I’m walking, I’ll follow it. Though I’m partial to cats, large and small, bats, and otters, I simply love all animals and being around them or just looking at pictures of them makes me happy. Conversely, though I have a reputation for being unemotional, animals in cages make me cry. That moment when you are reading a book and you realize you really, really like it. Also, every other moment of reading a book. Also, being near books. Okay, books in general. I love reading. I’ve read 78 books so far this year. 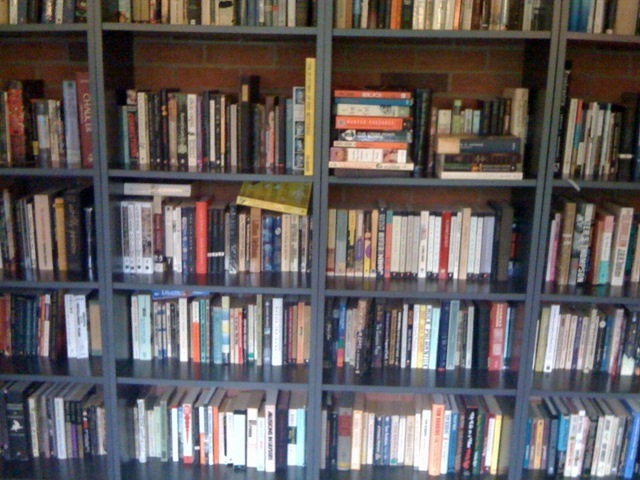 According to the database I created to log them, that’s 2.29 books a week. Few things in life make me happier then curling up in my reading chair with a book, gazing at my bookshelves, being in a bookstore, or frankly, even ordering books online. The smell of: onions sautéing, basil, bread baking, chocolate, lemons, coffee, garlic on my hands (not so much my breath). In general, cooking. Well, obviously. I have a whole blog about it. But it makes me happy. On the rare occasions I don’t make dinner when I get home from work, I’m actually very disoriented. It feels quite wrong to not spend at least an hour in the kitchen every night. Sitting down to a good meal, with wine. Nothing says relaxation to me like dinner and wine. Good dinner, made with fresh foods. It often takes me an hour to eat dinner because I savor it. I love to eat. I love to eat a little too much. Old things. My kitchen is full of vintage Pyrex and antique cast iron. I am distrustful of new things. I want to live in an old Victorian house, filled with antiques and oddities. Not particularly nice antiques, though; I don’t like expensive things. Just well-made, sturdy, unique things with a history. My latest thing is vintage mason jars: I’ve bought a bunch of them to store my dry goods in. I’ve tried saving jars from food I buy, but I make so many things from scratch I really just don’t accumulate that many jars, especially of the sizes I want, so I’ve been storing grains and things in plastic containers. I have wanted to switch to glass for a long time but thought it would be kind of costly to buy old jars in the quantity I need. Turns out they manufactured so many canning jars in the first half of the 20th century (and earlier) that they are actually pretty inexpensive. It would have been even cheaper for me to just buy a couple of cases of new canning jars, but you know, I didn’t even think of that until I’d already placed bids on old ones. And I don’t care; I just prefer the older ones. Not to collect – I’m not really a collector of anything – in fact, I prefer whatever is common or imperfect just because I’m less ill at ease about breaking it. I just like knowing my jars were used by someone before me. I like it best when I have old things that come from my own family, but it doesn’t matter if I don’t know who had the thing before me. My jars are almost 100 years old. I find that comforting for some reason I can’t explain. That “a-ha!” moment when you are learning something new and it suddenly clicks. I love learning. I love school. I even love taking tests. It’s my life’s mission to collect as many Bachelor’s degrees as I can. I can’t decide if Physics or Neuroscience should be next! The sound of Nick Cave’s voice. The music of Einsturzende Neubauten. The Smiths. Morphine. And hundreds of other bands – music in general, really – but if I need to MAKE myself happy, or sooth myself, I’m certain to pick one of those four. 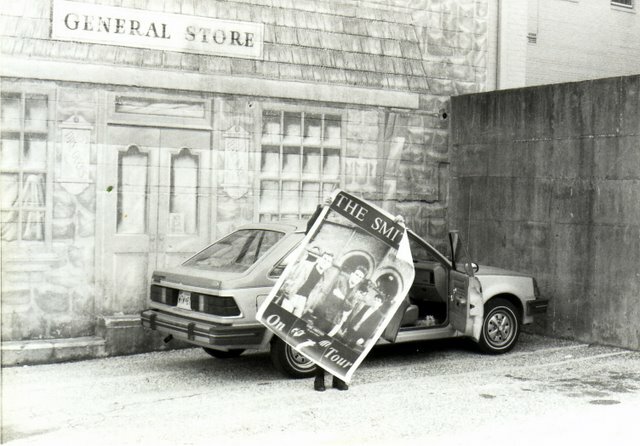 This is me buying a Smiths poster that is bigger than I am, in front of my first car. This may make me a terrible person, but my car. My non-hybrid, not-particularly-fuel-efficient, non-vegan (it has leather seats, which by the way I HATE, not just because I’m vegan but because they are hot in the summer and cold in the winter – who thought that was a good idea? ), lovely little tiny car of joy. 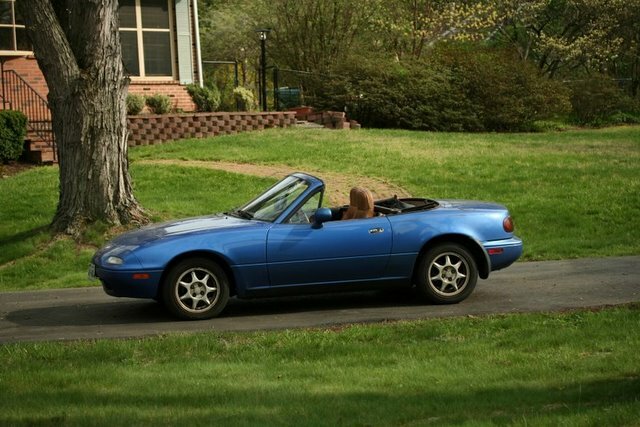 It’s a 1995 Mazda Miata that I bought used (the only reason it has leather seats) ten years ago. Driving around with the top down on a warm summer day is one of my favorite things. So is driving around with the top down on a crisp autumn day. Especially so is driving around with the top down on a sunny, fragrant spring day. Winter…not so great for the Miata. Taking off in a plane, and any travel by train. No matter how much I travel – and how degrading and awful TSA makes the experience – I still find it exciting to get on a plane. I just love going somewhere new – or familiar – even if it’s just for work. I especially love travelling by train, though, particularly in Europe. Not that I’ve done a huge amount of train travel in Europe, but I’ve done enough to know I love it. If I lived in Europe, I’d be on a train every weekend going somewhere new. Watching TV with Mark (and kittens). No matter how stressful my day has been, I heave a huge sigh of relief when I collapse on the sofa next to Mark to watch the X-Files or whatever we’re into at the moment. I also like coming home together late at night after we’ve been out somewhere and just being glad to be home, together. So, that was way more than you cared to know about me. I had a hard time narrowing it down to ten things. I’ve left so many things out. These, though, are all things I do every day (except travelling), which I guess means I’m one very happy person – who knew? I’m supposed to pass my award on to other bloggers, but I’m afraid I had enough trouble working up the nerve to drone on and on about myself. So I’ll do the cop-out thing and say I award it to all of you: if you are reading this and you have a blog, I really do want to know what makes you happy, so post me a link. Bring to a boil, reduce heat, and simmer until jalapenos are soft, about 10 to 15 minutes. Refrigerate for at least three weeks. That’s it! The hardest part is not eating them for the three weeks. I actually ended up waiting four, but they were worth the wait. … and stuffed them into a burrito. They were REALLY good! I don’t know why I’d ever buy pickled jalapenos again. The second hardest thing about the pickled jalapenos was getting a picture of them that didn’t involve Gomez, who kept getting between the peppers and the camera. This picture was taken with Torticia climbing atop me as I squatted on the floor. SO MANY KITTENS! Nona, if you’re reading this, I really do think he looks like a baby Crookshanks. Zach promised to take us to Peace O’ Pie on Monday, which I was extremely excited about, but then it turned out they are closed on Mondays and I shed tears of pain and grief (as we were leaving on Tuesday). Apparently the entire city of Boston shuts down on Mondays. Smuckalert asked us to walk along the Charles River with him so he could take pictures on Monday and I told him it was probably closed. (It wasn’t, but it was very, very, very hot. I thought Boston would be an escape from the heat?!) Zach mostly redeemed himself by suggesting we go to Addis Red Sea instead, which was conveniently located right down the street from Nick’s place, and although it took forever the food was fabulous (although not quite DC Ethiopian fabulous; that’s one thing DC does right). 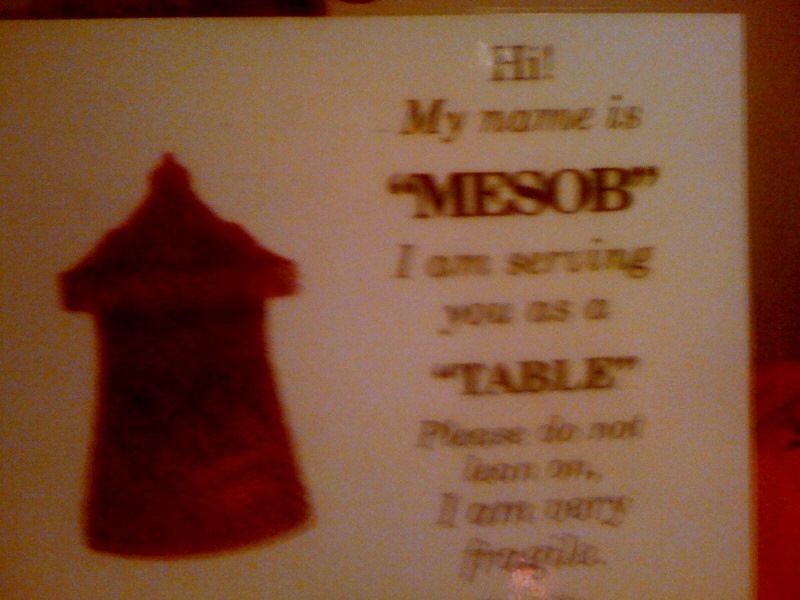 I LOVE Ethiopian food, so I was about to burst with excitement, as well as hunger. I was so hungry and excited, I quite forgot to take a picture of the grub, but I DID take this picture, which I wanted to submit to The “Blog” of “Unnecessary” Quotation Marks, but it turned out too blurry. Busy upcoming weekend; it may be another few days before I’m able to post again, but I found a vegan grill cookbook in the library, so I’m looking forward to grilling up a bunch of stuff in the very near future and I’m sure I’ll have my camera in hand. Until then, mates, g’day! When I still lived in Baltimore, I worked at the newspaper, where one of my co-workers was a girl named Joann. Although we weren’t really friends outside work, I always thought Joann was a really neat person: I really liked her personal style, and she was very creative – during downtime at work, she made her own jewelry and she was always involved in something artistic. You could say I admired her. 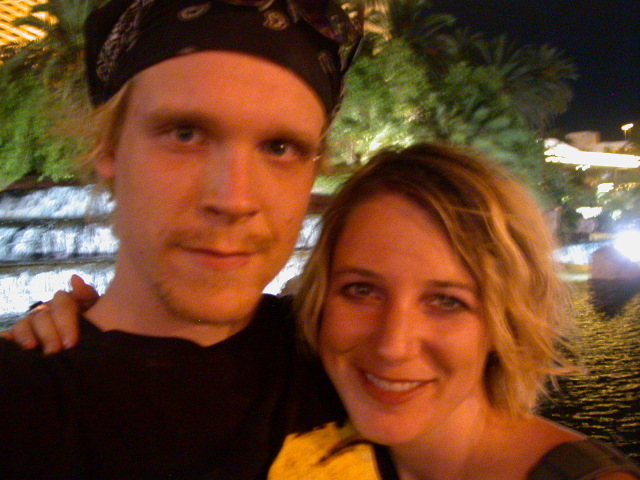 Joann saved up some money to take her dream vacation to Senegal, and while she was there, she fell in love. This resulted in a couple of trips back and forth for both of them, culminating in a wedding (followed, unfortunately, by nearly a year of living on different continents until her new husband was able to get a US visa). We had a bridal shower for her at work and after some research, I made benne (sesame seed) wafers to bring her good luck, as well as some other African-inspired dish I no longer remember. For reasons I also don’t remember, Joann apparently brought food in for her own shower (unless she made this for the office at some later time), including mafé, which she made vegetarian just for me, which I thought was incredibly nice of her. It was also really good and at my insistence, she later gave me the recipe. Although I’d been vegetarian for a long time, I was a pretty new vegan and was just getting into cooking. This mafé recipe was perfect for me because it was really easy, really tasty, and it was exotic. I was at that stage a lot of new vegans go through where they realize how limited their diet was before they went vegan and how diverse it can be after going vegan. I felt like whole new worlds of flavor were opening up for me. So not only is this recipe delicious and particularly simple, it’s a meaningful one to me. If using dried black eyed peas, soak for 30 minutes. I was delighted to find fresh ones at the farmer’s market, though I had no idea how much fresh I should use. After comparing a dried pea to a fresh one, I concluded the dried one was 1/4 the size of the fresh and used about 2 cups fresh, which was what was in my pint. Combine all ingredients except peanut butter in a large pot. Add water to completely cover. I also added several dashes of liquid Maggi seasoning. Bring to a boil, lower heat, and simmer until peas and vegetables are soft. Joann noted this would be about 1 hour and 15 minutes for dried peas; it was a little less for fresh peas. Taste the concoction periodically and when it is as spicy as you want it, remove the habanero, which may have burst; if so, remove the pieces. My typed recipe from Joann contains a pretty stern caution to NOT TASTE/EAT THE PEPPER! !, but if you live with a Smarkasauraus, you might try giving it to him. Try as I might, I never found my habanero, but we are used to a lot of heat and Mark actually found it necessary to add some habanero Tabasco to his portion. Put half of the peanut butter in a small bowl and ladle some of the hot broth into the bowl; whisking until smooth. Add to the soup pot and do the same with the remainder of the peanut butter. Simmer 15 more minutes. Serve over rice. Joann said she used broken jasmine rice; I used brown basmati. No moderate-sized rat ever seemed to carry out any predatory operations in these regions; they were all enormous in their enormity. … but it made me think of Gomez, who I think is enormous in his enormity. However, he’s not so enormous he fits in a full-sized harness, and I’m not sure they even make a harness that fits 5-month old kittens who are enormous in their enormity but aren’t full-grown either. In this picture you can see how he’s worming his way right out of his harness, although he’s not doing intentionally. As soon as I realized this, I took him inside and rigged up a tighter harness using a twist tie. Surprisingly, Gomez was less nervous about being outdoors than Torticia. Usually Torticia is the braver one. But Gomez strode right out and started rolling around in the sun like a goof. Meanwhile, Torticia sat near the door and looked a bit skeptical. I think maybe she wasn’t too wild about the harness; sometimes they make cats not want to move. She just sat and watched Gomez. Then someone started up a lawn mower somewhere and outside time was over instantly. Gomez was up and back in the house like a rocket, with Torticia right on his heels. I couldn’t even find him to take his leash off for a couple of minutes. Overall, though, it went well and I think they’ll both do pretty well on leashes, which I’m sure makes me look like a crazy cat lady. In other news, Smucky is here for a visit right now, and he and Mark and I are going to Boston this weekend. I haven’t been to Boston in over ten years! Anything I must see, eat, or do? This is one of my all-time favorite breads, and judging by the reactions I got when I served it as rolls at the party last weekend, it’s a big hit with others as well. I like it best in roll form, partly because it freezes so well that way, so that’s what I have documented here, although I’ll give you bake times for loaves as well. Jeffrey Hamelman is a Certified Master Baker and Bakery Director at King Arthur Flour. (I buy all my flour at King Arthur, by the way, and highly recommend it.) I’m always pushing Peter Reinhart’s bread books on you because I think his books are the absolute best for beginner bakers, but my other favorite bread book is Hamelman’s Bread: A Baker’s Book of Techniques and Recipes. It comes off a bit more advanced than Reinhart’s books, and with recipes scaled for both bakery and home use, it seems aimed towards very serious bakers, but he does have some really great, well-written chapters on technique – it just lacks all the pretty pictures Reinhart’s books have. I’ve never made a bad loaf of bread from this book, and every single one has come out of the oven crackling and beautiful. Because I found this recipe on The Fresh Loaf and several other websites, I decided it was okay to share with you. But I must repeat that this is an excellent book, and if you make and like this recipe, I highly recommend you buy the book. 1.6 oz (3 Tbsp) mature sourdough starter * –> I explained how to make your own here, and you can also buy it from King Arthur Flour, which is actually where my current starter came from, which I guess means I’m baking with the same starter Hamelman is! * I can’t vouch for the flavor because I’ve never done this, but if you are dying to try this bread and don’t have a starter and aren’t interested in growing one, you could use 1/4 tsp yeast here and essentially make a pâte fermentée. Also, I use more starter than what Hamelman calls for here. Instead of just 1.6 oz, I use half of my current starter so I’m doing a regular feeding of it; this is about 4 oz. Because I do this, I reduce the instant yeast in the final build somewhat. * The reason Hamelman calls for “all less 3 Tbsp” of the liquid levain is he expects you to reserve that 3 Tbsp to perpetuate your starter; however, since I’ve already saved half of my starter, I just include all of the liquid levain build in my final build. I have to make small adjustments in my final build – namely a little less water and/or more flour – to account for this. The night before baking, build the liquid levain by mixing together all of the ingredients in a medium bowl. Cover (I use a plate to save on plastic wrap) and let sit at room temperature for 12 to 16 hours. Also the night before, prepare the soaker by mixing together all the dry ingredients and then covering with boiling water and stirring well. Cover and let sit at room temperature with the levain. On baking day, place all ingredients, including the soaker and levain, in the mixing bowl. I had a helper. Remember on the first day we got the kittens I said I thought Torticia might end up taking Tigger’s place as my kitchen assistant? Turns out I was right. If kneading by hand, stir until it comes together, then knead for probably about 10 minutes (Hamelman doesn’t even assume you’ll be doing this and I’ve never tried, so I’m guessing here). If using a mixer, mix on first speed for 3 minutes, adjusting the water or flour as necessary. You want a fairly tacky dough; it may seem pretty wet, in fact, if you aren’t used to high hydration doughs. Then mix on the next highest speed for 3 to 3 1/2 minutes. … then dump the dough from the bowl onto the flour, pulling it into a nice ball and coating it very lightly with the flour to make it easier to handle. At the risk of looking like an advertisement for King Arthur Flour, here is my dough in their Dough-Rising Bucket, which I find indispensable for rising large batches of dough. Of course you can also use a large bowl, covering with either plastic wrap or a large plate as I demonstrated above. In either case, spray lightly with oil, then put the dough in. … and repeat the process. Return to the bowl (folds down) and let rise for the second 45 minutes. It should about double. Remove the dough and shape. This recipe makes three 1.5 pound loaves, which you can shape into round or oval freestanding loaves. You can also make larger loaves. My favorite, though, are rolls. I divided the dough into 16 pieces about 5 ounces each. Then I formed rolls by pulling together the dough on the bottom and forming a seam, pulling the dough so the surface is taut on the opposite side. This is hard to describe and photograph, but both Hamelman and Reinhart do a better job than me in their books. This roll is upside down (seam side up). The other side should be smooth and full of surface tension. I panned 8 to a tray (now they are right side up – seam side down). Cover and proof for an hour. Meanwhile, preheat the oven to 460 degrees Fahrenheit. To bake, I steam the oven by placing 1 cup of hot water in a cast iron pan (which I have devoted to this exclusive use) I keep on the bottom rack of my oven. If you don’t want to do that, spray the rolls with water and/or spray the oven walls with water just after loading the rolls. I had to bake each half-sheet pan separately, but you can bake 2 (possibly 3 if your oven is large) loaves at a time. Rolls take 20 to 25 minutes, 1.5 pound loaves 40 to 45 minutes, larger loaves a bit longer. Don’t underbake this dough; the seeds retain a lot of hydration and it takes extra time to bake. It should be a dark golden brown. One of the biggest mistakes most novice bakers make is not baking long enough; they get nervous when they see dark browning. I had to train myself to let my crusts get darker than I thought I wanted them to be. I think I read somewhere that you should bake bread until the crust is as dark as you expect it to be, then let it bake five more minutes. I could have let these get even darker. Let cool for at least an hour (maybe 45 minutes for rolls) before slicing. Don’t be tempted to ignore this step! The cooling process is nearly as important as the baking process and you can ruin a loaf by slicing it too soon. For most of the breads I make, keeping Mark from slicing it too soon is the hardest step! Simple sandwich of perfectly ripe tomato from the farmer’s market, freshly ground salt and pepper, and a little Vegenaise. Heaven! If you freeze these, we’ve found that microwaving them for 30 seconds at normal power to defrost is perfect. There is little to no taste difference between fresh and frozen, so I love making a batch of these on the weekend and having “fresh” rolls on weeknights or for lunches for the next few weeks. The kittens went outside (on leashes!) yesterday, but this has been a long, photo-heavy post, so I’ll fill you in on it in a later post, which will be soon because I’m cooking up something special today.